Is this the weirdest thing you've heard this week? 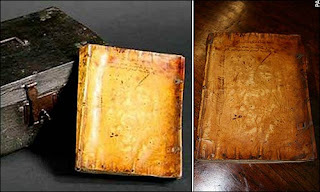 The book is a Protestant telling of his story and was bound in 1606. There seems to be a face on the book cover; tradition has it this is an image of Fr Garnet himself. Garnet was implicated in the Gunpowder plot but was clearly a martyr for the faith.